Hi, welcome to Hunters Hot Sauce. I'm Ron and this is how it all got started. My friends and I used to go hunting all the time. At first we just stayed in our cars, we took the Coleman stove out of the trunk and cooked breakfast; egg sandwiches with hot sauce on them. As we got older we stayed in tents for deer season week. We would make a list of what to bring; beer, food, TP and hot sauce. I was the cook; I was always up at 4:30 a.m. making breakfast on opening day which was hard after playing cards until 2:30 a.m.! Eggs, bacon, sausage, hash browns and of course hot sauce. Later we got a cabin, life was easy now! After a hard day of hunting (or hiking with weapons!) we would come back and make a good hearty dinner which always included hot sauce. Hot sauce was always on the table; breakfast, lunch and dinner. So I decided to make my own concoction. It is a sweet mild habanero flavor with a unique taste to it. It's good on everything from field to stream! 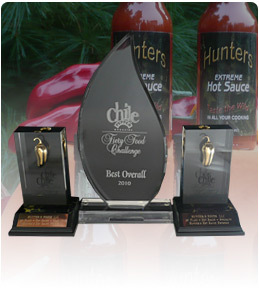 Hope you like Hunters Hot Sauce and good hunting! !